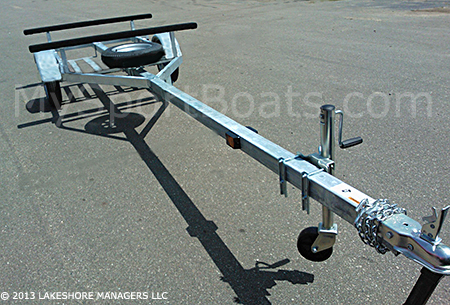 The Dolphin Bravo Sailboat Trailer is designed to carry the Hobie Bravo sail boat. Trailer features two carpeted, raised 52" wide carry arms. The Hobie Bravo sail boat trailer comes standard with a galvanized all welded frame making it ideal for use in both salt water and fresh water locations. Optional mast stand, see options below. This sailboat trailer ships unassembled on a pallet by truck freight (semi).